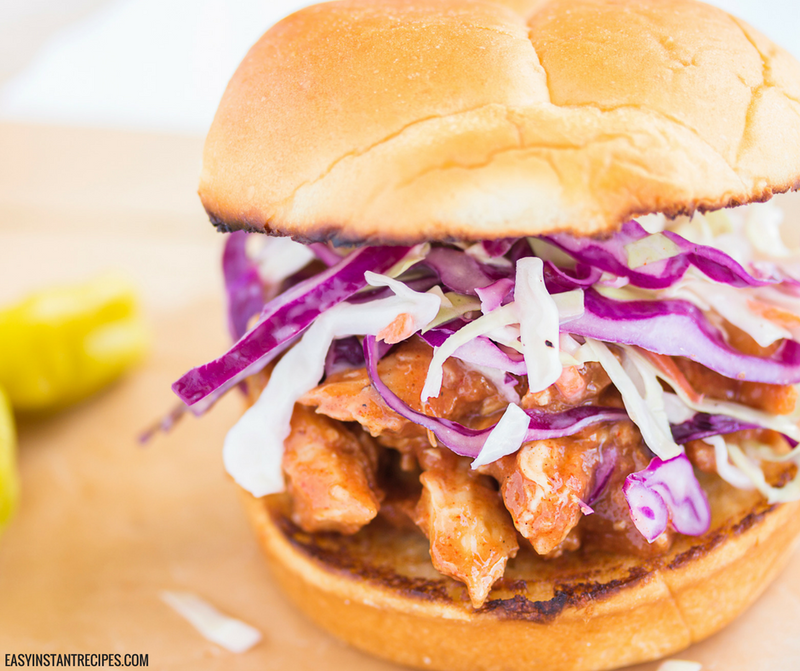 If you love buffalo chicken, then you must try these Instant Pot Buffalo Chicken Sandwiches! These quick chicken sandwiches are full of flavor and fun! I absolutely love quick and easy recipes, and this buffalo chicken recipe is exactly that. I love that there are less than 5 ingredients in this recipe – chicken, Frank’s hot sauce, and ranch seasoning mix. The buffalo shredded chicken is also great on more than just sandwiches! I love this shredded chicken on top of salads and my kids love them in wraps or in quesadillas. But, be warned – this buffalo chicken definitely comes with a kick. When I make these for my kids I add in 1/2 stick of butter or 1 package of cream cheese to bring the spice down a bit. You could also ease up on the amount of wings sauce or give a milder sauce a try. Buffalo Wild Wings has a fantastic flavor pack with some milder options – we love the Asian Zing! Place chicken breasts and buffalo sauce in pressure cooker. Sprinkle seasoning over chicken. Cook on high pressure for 10 minutes. Quick release. Add in additional buffalo sauce if needed. Serve hot on hamburger buns or on flat bread with coleslaw. If you aren’t making these shredded buffalo chicken sandwiches in your pressure cooker right this second, then pin this post so you can easily find it later!